Hillary Clinton won the Benghazi hearing. It was supposed to damage her campaign. Instead it will be a coup. 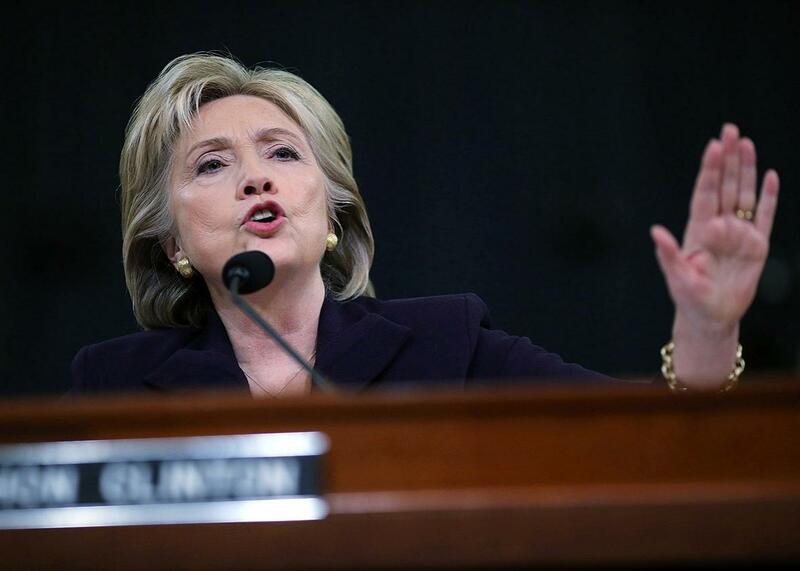 Democratic presidential candidate and former Secretary of State Hillary Clinton testifies before the House Select Committee on Benghazi on Oct. 22, 2015, in Washington. The most honest moment of Hillary Clinton’s hearing before the House Select Committee on Benghazi came toward the end of its third hour. “Those who want to believe the worst will believe the worst. Those that want to believe this is a partisan exercise will believe it,” said Rep. Adam Schiff. He’s right. If you don’t like Clinton—if you think she’s a liar and a disgrace—then this hearing doesn’t matter. It changes nothing. And if you think this is a farce—an “abusive effort” to derail Clinton’s presidential campaign—you’ll walk away unmoved. Still, it’s possible to judge and evaluate a performance. Ignoring our baked-in reactions to either Clinton or House Republicans, how have both sides fared in this long-form exercise in political theater? The GOP’s job was simple: Try as hard as possible to dispel the belief that the Benghazi committee is a partisan witch hunt, as it was essentially described in an unintentionally revealing moment by House Majority Leader Kevin McCarthy. To do that, GOP members had to keep calm, stay sober, and approach Clinton as determined but ultimately fair-minded investigators. For the first hour, they succeeded. Chairman Trey Gowdy was measured and serious, if defensive about his committee—“Not a single member of this committee signed up to investigate you or your email”—while Rep. Peter Roskam of Illinois, who followed Gowdy’s opening statement, asked careful questions aimed at establishing Clinton’s role in building the administration’s policy in Libya. By the next hour, however, Republican propriety fell apart. During a testy back-and-forth with Clinton, Rep. Mike Pompeo of Kansas condemned her for lack of visible accountability in the State Department’s handling of security in Benghazi. “How come not a single person lost a single paycheck connected to the fact that we had the first ambassador killed since 1979? How come no one has been held accountable to date?” he said. “Well, congressman, the Accountability Review Board pointed out several people working in the State Department who they thought had not carried out their responsibilities adequately, but they said they could not find a breach of duty,” Clinton replied. When Pompeo couldn’t get the answer he wanted, he moved to another claim—that the State Department was meeting with al-Qaida fighters in Libya. “[Y]our officials were meeting with this man on the ground in Benghazi, Libya, discussing security,” he said. When Clinton couldn’t give an answer on who those officials were—she wasn’t aware of the meeting—he yielded his time. It was unclear if Clinton was caught or if Pompeo knew he couldn’t deliver the goods, but it didn’t appear to hurt her. Later in the hearing, after the break, Pompeo would press Clinton on her relationship to Ambassador Christopher Stevens—who was killed in the attack—versus her relationship with Sidney Blumenthal, a longtime ally. Did Stevens have her personal email address? Her home address? Pompeo also pressed Clinton for her approach to management: Why, as the chief diplomat responsible for thousands of employees and facilities, wasn’t she involved in managing each aspect of embassy security? Likewise, in a similarly long but fruitless exchange, Rep. Jim Jordan of Ohio indulged a whole host of breathless—and debunked—claims about Clinton’s involvement in Benghazi: that Clinton lied about protests, that she lied about the relevancy of an anti-Muslim video that had sparked an uproar in the Middle East, and that she attempted to cover up crucial information. This had a rhythm: Jordan would bark a question, Clinton would try to answer, and Jordan would interrupt her. By the end, she was clearly bored and contemptuous of the exchange. But this was just a preview of the worst moment of the first three hours. Before the hearing broke for its lunch break, Gowdy—after denying that the committee was a “prosecution”—asked aggressive questions about Clinton and her relationship to Blumenthal: whether she solicited his advice, where he got his information on Libya, and why she passed his emails on to others. For a committee ostensibly about the attacks in Benghazi, it was an unusual exchange, made worse when Rep. Elijah Cummings—the ranking Democratic member—demanded that Gowdy release the full transcripts of Blumenthal’s testimony, sparking a loud and bitter fight over the direction of the hearing between the two men. Even for this Congress—among the most unpopular in recent history—it was embarrassing. Retreat from the world is not an option. America cannot shrink from our responsibility to lead. That doesn’t mean we should ever return to the go-it-alone foreign policy of the past, a foreign policy that puts boots on the ground as a first choice rather than a last resort. Quite the opposite. We need creative, confident leadership that harnesses all of America’s strengths and values, leadership that integrates and balances the tools of diplomacy, development, and defense. You don’t have to like Clinton to see that this is a coup for her campaign. Not only has she bolstered her image as a smart, competent policymaker, but she’s even defused her email controversy—or come close to it—by talking about the issue in a calm, nonadversarial way. Meanwhile, by the fifth hour, committee members like Roskam were hitting Clinton for having a skilled press team. Whether or not Republicans built the Benghazi committee to damage Clinton’s campaign, it’s clear they weren’t opposed to an outcome where Clinton was harmed. Instead, we have the opposite. Thanks to the committee, Clinton might escape a scandal, neutralize an attack, and enter the first major stretch of the presidential race with the wind at her back.